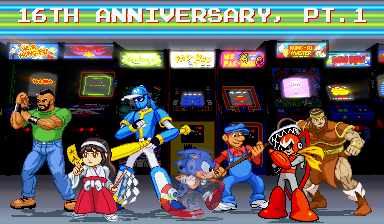 I couldn’t just let the 20th anniversary go by without doing at least a little something. 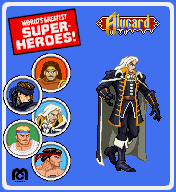 A new Alucard sprite has been added to the Castlevania Custom Sprite gallery and the main image generator. There will be another small update in a few days, mainly adding the Mega Man NES screens to the new generator engine. Mega Man content is still a good way to get attention, isn’t it? I’m allowed to say that out loud, right? This update could be done only at night, for it is filled with Vampires! 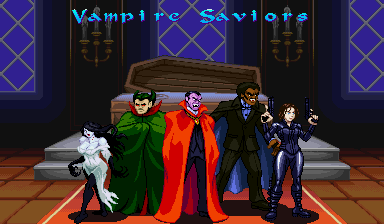 All of these bloodsuckers (and their mini-logos) have been added to the GFX Generator, where you can make your own screens and graphics, including one with that new Dracula’s lair background based on the original Castlevania. 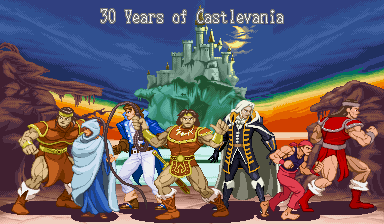 The original Castlevania turned 30 years old earlier this year, when I promised that you’d see more new tributes to that series during the DangerTerrorHorrorThon. 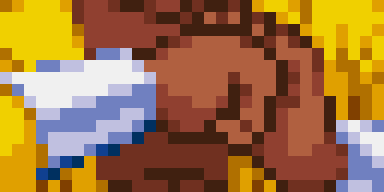 Yesterday’s update featured a new sprite of Richter Belmont, but it’s time to pay homage to the original game. 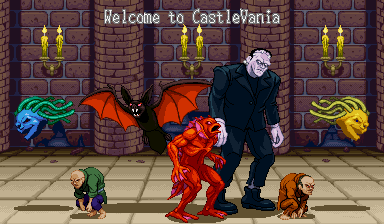 The new sprites and a new background based on CastleVania Stage 5 have been added to the new GFX Generator, which you can use to make pics like the one near the top of this post. If you think the DangerTerrorHorrorThon is done with you today, you better think again. There will be yet another installment tonight to satisfy your ghoulish appetites. edit: mislabeled the Phantom Bat as Darkwing Bat (I was using the SotN sprites as extra reference), now fixed. – Movies: El/Eleven from Stranger Things, Trash from the Return of the Living Dead and Frank Stewart from the WNUF Halloween Special. Yes, I know Stranger Things isn’t a movie, but it’s on that page for now. All of the new sprites and mini-logos were added to the new GFX Generator, which you can use to make pics like the one near the top of this post. 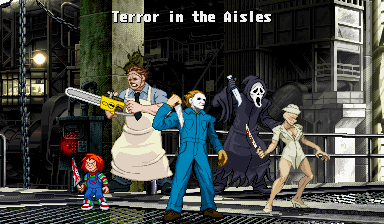 I also added a “horror” character list so you can easily find horror characters to build your own nightmares. The madness continues tomorrow with even more sprites! Thanks to the way I wrote the new engine, I can add more things to that last-minute modifier section in future updates. 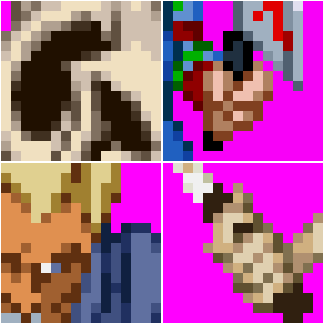 Sorry for not having more new Castlevania sprites for today (the anniversary snuck up on me), but I think most of you know you’ll be getting some about a month from now. Last, but not least, multiple pixel donations from Tonner Topper (thank you!) were added to the Sprite Rips and Sprite Edit Pack pages. 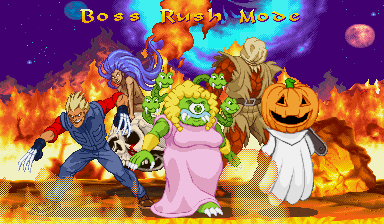 Anyone looking for CPS2 bg effects should check out those custom packs on the Sprite Rips page! edit: as more proof that I work on this site when I’m half-asleep, I mistakenly had Topper’s name as Tonner when this was originally posted. I’m very, very, very, very, very, very, very, very sorry for messing up on that and it’s now fixed. 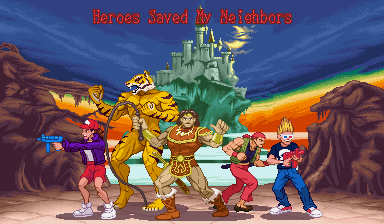 To everyone who has checked out the site back in the days of Vs. Mode fights and Minus World madness (the site section, not the completely different website), those who just visited for the first time today and every party person who falls somewhere in between, thank you for stopping by and making these sixteen pixel-packed years fly by. Get ready for multiple days of anniversary updates, starting with a seven-sprite kickoff! – Sega: Sonic the Hedgehog… decided to start running right as I clicked on the GFX Generator screenshot maker. See, that’s just rude. Maybe someone told him Protoman was the coolest person in the pic or perhaps he was scared off by the Zoo Keeper. Don’t worry, this isn’t the only update this week, so let’s see if I can get him to slow down for another sprite before the anniversary updates are done. 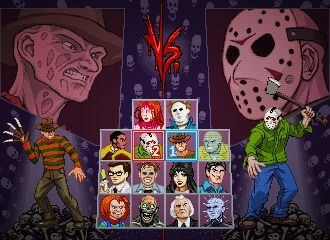 All sprites were added to the aforementioned GFX Generators (the old GroupShot and Vs generators). 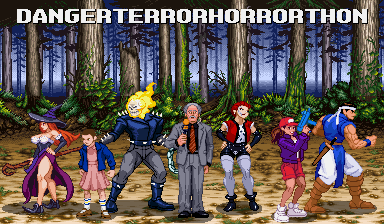 The DangerTerrorHorrorThon continues with a crew of heroes, but will they be enough to hold off the threats on the way? All new items have been added to the GFX Generators. Tomorrow’s update will be smaller, almost like a break. But what kind of break? Tune in tomorrow to find out!